Israeli warplanes and tanks late on Saturday bombed several targets in the Gaza Strip. 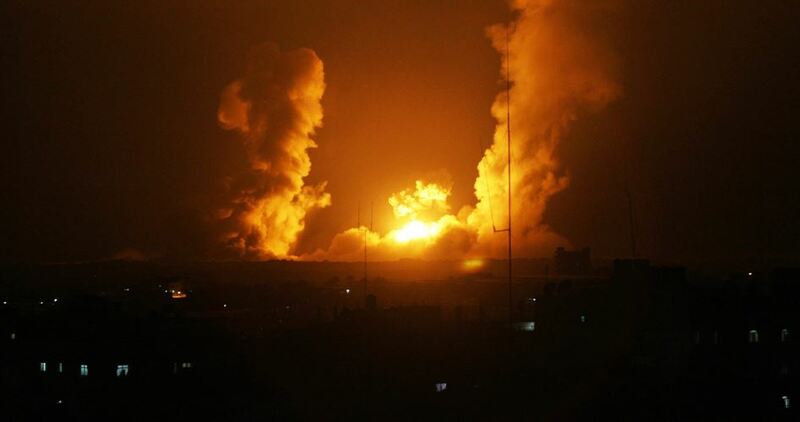 The PIC reporter said that Israeli warplanes launched airstrikes on a resistance post and open areas in Gaza city. The air raids were followed by artillery shelling on another post in the same city, he added. 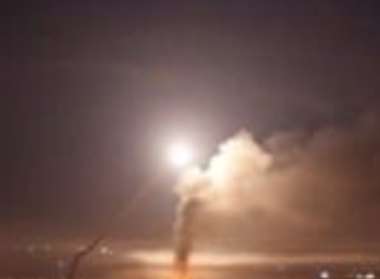 Earlier on Saturday, the Israeli occupation army claimed that a rocket fired from the Gaza Strip landed on an Israeli settlement neighboring the enclave. No damages or injuries were reported. No Palestinian resistance group has claimed responsibility for the alleged rocket attack. The Israeli occupation army on Friday killed a 45-year-old Palestinian woman and injured 128 protesters in the Great March of Return. Following Friday’s bloody protests, Palestinian resistance groups in Gaza warned that they would respond to any Israeli aggression on the besieged territory. 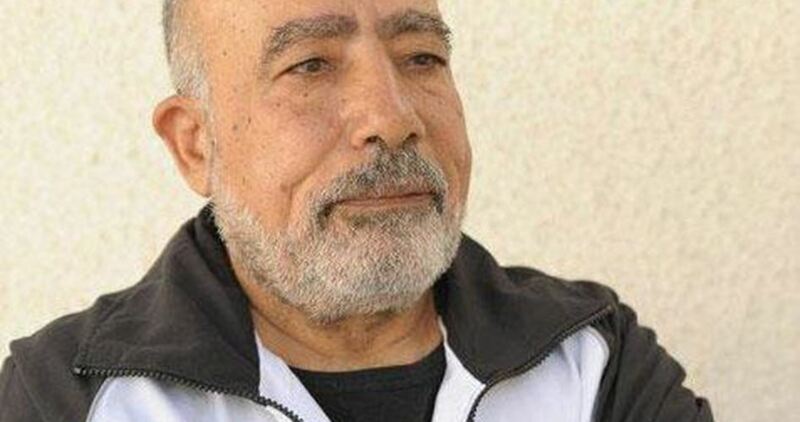 The Palestinian Commission of Detainees’ and Ex-Detainees’ Affairs has said that 80-year-old prisoner Fuaad ash-Shawbaki are being exposed to medical neglect in Israeli jails. Shawbaki, who has been in jail for over 12 years, suffers from chronic health problems and does not receive proper medical care, according to the Commission. With no regard for his old age and health condition, Israeli jailers transferred Shawbaki several times between prisons in recent years. Shawbaki was arrested on March 14, 2006 when the Israeli occupation forces advanced on and surrounded the Jericho prison in which he was imprisoned along with Ahmad Saadat, the general secretary of the Popular Front for the Liberation of Palestine, and others. Later, an Israeli military court sentenced him to 20 years in jails on a charge of supplying the Palestinian resistance with weapons. 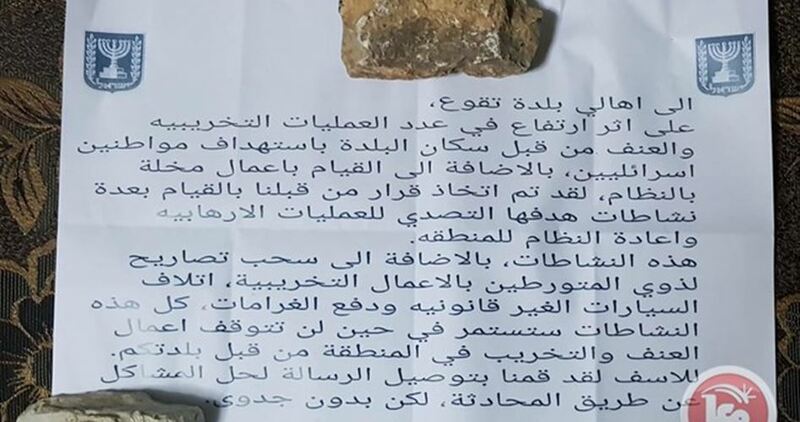 The Israeli occupation forces (IOF) on Sunday handed the local authorities in Teqoa town, east of Bethlehem, a military notice threatening to take punitive measures against the residents. According to the military notice, the Israeli army said there would be severe measures, including withdrawal of permits and financial penalties, against the families of young men who throw stones at Israeli cars and carry out acts of sabotage. The army also threatened to carry out activities in the area to confront acts of sabotage and violence against Israeli citizens. During their presence in the town, the IOF kidnapped a 16-year-old teenager called Oday al-Ammour from his home. The Israeli occupation authorities on Sunday issued a three-month administrative detention order against the Palestinian prisoner Omar al-Barghouti, the father of martyr Saleh al-Barghouti. 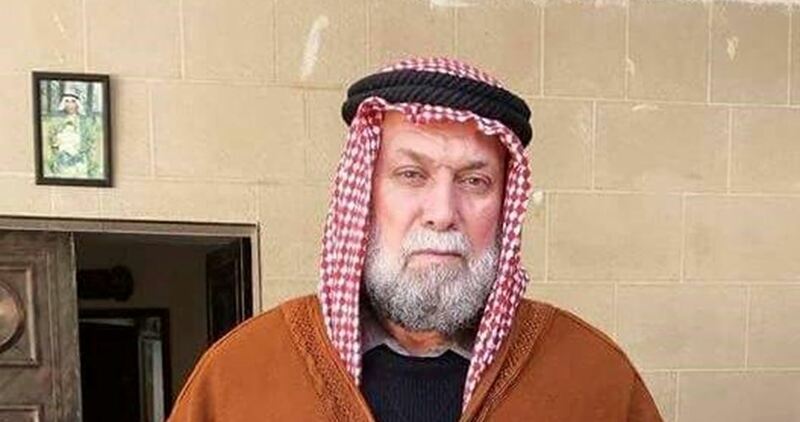 The Palestinian Prisoner Society said that Omar al-Barghouti, 66, has been subjected to harsh interrogation at al-Maskoubiyya detention center since he was arrested on 12 December 2018. The Israeli occupation forces arrested al-Barghouti and dozens of Palestinian youths during a raid into Kobar village in Ramallah hours after they killed his son Saleh. Al-Barghouti’s family have been subjected to collective punishment since the killing of Saleh. Most of the family members are currently held in Israeli jails, including al-Barghouti’s sons Asem, Asef, and Mohammed. Omar al-Barghouti had spent over 26 years in Israeli lock-ups. He is the brother of the well-known Palestinian prisoner Nael al-Barghouti who is serving his 39th year in Israeli prisons. Since March, more than 250 Palestinians have been killed and thousands more injured by Israeli army fire during protests near the Gaza-Israel buffer zone. Protesters demand the right to return to their homes and villages in historical Palestine, from which they were driven in 1948 to make way for the new state of Israel. They also demand an end to Israel’s 12-year blockade of the Gaza Strip, which has gutted the coastal enclave’s economy and deprived its more than two million inhabitants of many basic commodities. GAZA, PALESTINOW.COM — The Qassam Brigades, the armed wing of Hamas, seized “great secrets” during the failed Israeli security operation in the Gaza Strip on Nov., its spokesman said on Saturday. “We seized equipment and technical devices that contain great secrets. The enemy [Israel] thought that made tools and equipment unusable and the equipment became evaporated,” Abu Ubayda said at a news conference in Gaza. On Nov. 11, the Qassam Brigades announced that they had discovered an Israeli forces’ infiltrating into Khan Younis, east of the Gaza Strip. Seven Palestinians and an Israeli soldier were killed in the undercover Israeli infiltration. The incident was followed by an Israeli military escalation against Gaza. Ubayda said the aim of Israel’s operation was to install bugs to listen to the network of the Palestinian resistance. He added Israeli’s efforts went down in the drain despite the country used all of its opportunities. He also called on people, who spy on behalf of Israel, to swear off. The Gaza-based Palestinian Interior Ministry announced on Tuesday the arrest of some 45 Palestinians accused of collaboration with Israel’s operation to infiltrate Khan Younis. 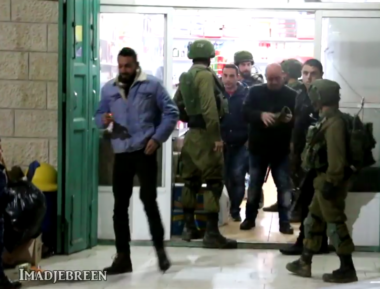 Israeli soldiers invaded, on Saturday at night, many areas in the central West Bank governorate of Ramallah, and fired gas bombs, concussion grenades and rubber-coated steel bullets at Palestinians, protesting the invasion, causing several injuries. The Health Ministry in Ramallah said the seven Palestinians were rushed to Palestine Medical Complex, including one who suffered a moderate injury, after the soldiers shot him with a rubber-coated steel bullet in his eye. It added that the soldiers also caused many Palestinians, including families in their own homes, to suffer the effects of teargas inhalation. 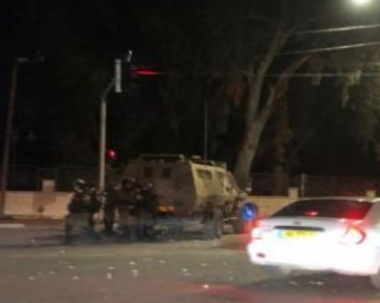 The soldiers invaded the al-Masyoun neighborhood, Ein Monjid, Ramallah at-Tihta, and the area surrounding the City Council. They fired several live rounds, rubber-coated steel bullets, gas bombs and concussion grenades, in addition to storming many stores and confiscating surveillance recordings and equipment. Also at night, the soldiers abducted Zeid Waleed al-Qawasma, 21, from the southern West Bank city of Hebron, after stopping him at the “Container” military roadblock, southeast of occupied East Jerusalem. The Palestinian Health Ministry in Gaza has reported, Sunday, that a man who was shot and seriously injured by Israeli army fire, three earlier, has died from his wounds in a hospital in the southern part of the Gaza Strip. 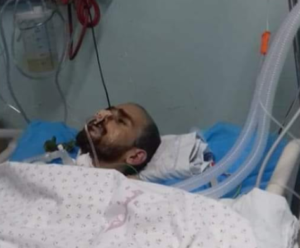 Dr. Ashraf al-Qedra, the spokesperson of the Health Ministry in Gaza, said an Israeli army sharpshooter shot the man, Anwar Mohammad Qdeih, 33, with a live in his neck, near the perimeter fence, east of Khan Younis, in southern Gaza. 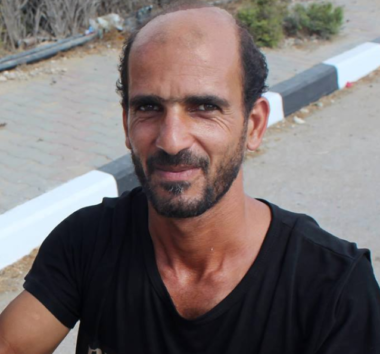 The man underwent several surgeries following his serious injury, on Friday, October 19th 2018, but remained in a critical condition at a Gaza European Hospital, until he succumbed to his serious wounds. 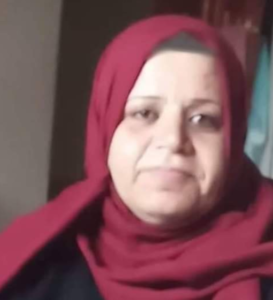 On Friday, an Israeli army sharpshooter shot and killed a Palestinian woman, identified as Amal Taramisi, 43, during the Great Return March procession, east of Gaza city.